Don’t forget to vote on Tuesday, February 26, 2019! During our November 1, 2018 bargaining session with LCS, LCTA proposed compensation that would total $3000 per employee: $2850 for salary increases and $150, on average, for performance pay for 18-19 and a total compensation increase of $1500 for 19-20. This proposal underscores the need for LCS to allocate its resources so that it can pay teachers a fair wage. LCTA worked with LCS when the District faced difficult financial times and, at times, modest salary increases or bonuses. Since its low point in 2013-14, the unassigned general fund balance has increased from 11.24 million (FY 2013-14) to its current level of 28.17 million (2017-18): 16.93 million dollars. Each year during this period, LCS made dire predictions regarding the unassigned fund balance possible performance. On average, LCS budgeted that unassigned fund balance claiming it would end the year at 6.9 million, when in fact it ended, on average, the year ended at 16 million. The district underspends its allocations every year, thus growing the unassigned fund balance. Claims that the District will inevitably be strapped for cash this year should be evaluated in light of these trends. 28.171 Million versus 11.33 Million? LCTA based its proposal on an unassigned fund balance of 28.171 million, its balance at the end of the fiscal year, and predictive trends. LCS based their response to our proposal on its prediction that the unreserved general fund balance will end AY 2018-19 at 11.33 million and the predictive trend will stop. 11.33 million is the amount LCS predicts will remain after the 2018-19 academic year, assuming that monies are spent as allocated and that no budgetary flexibility exists. On average, 13 million is leftover in this account each year, suggesting that LCS’s immediate budgetary future may not be as dire as asserted and that money can be re-allocated to fund teacher raises. Join LCTA and LCS this Wednesday, November 28, 2018 in the Howell Center at 5:00 p.m.
LCTA countered the LCS proposal of about $1,150 for a salary increase with a $3,000 salary market adjustment for this year. In addition, LCTA is advocating for career path for educators. LCTA is asking LCS to prioritize a living wage for instructional staff by seeking a two year deal that would keep up with the cost of health insurance costs and inflation. It is important to remember that LCTA represents all members of the bargaining unit. This includes teachers, guidance counselors, psychologists, librarians, and more. Therefore, we are all LCTA. We must all participate in the process if we are to address the priorities you brought up through the survey. See your LCTA Building Representative for more information on how you can become more involved. Watch the latest bargaining session here. Click below. Click the above image for a copy of your contract. Click to join the LCTA Bargaining Committee. Join us for the next internal bargaining session on Thursday, September 13, 2018. Sign up here. On Wednesday, August 29, 2018, Leon County Schools (LCS) and Leon Classroom Teachers Association (LCTA) met for the second time to discuss initial contract language proposals and compensation. All language and compensation proposals have been attached as they were shared at the table. LCTA and LCS are in the process of reviewing each parties proposals and will set future dates to continue bargaining. If you have questions or concerns or would like to participate in the process, we encourage you to contact LCTA and share your thoughts. Whether you are a member of LCTA or not this contract impacts your wages, terms, and conditions of employment. If you are not a member of LCTA, we strongly encourage you to contact your worksite building representative to join and preserve our right to bargain a contract. Please note, all underlined language indicates proposed new contract language. 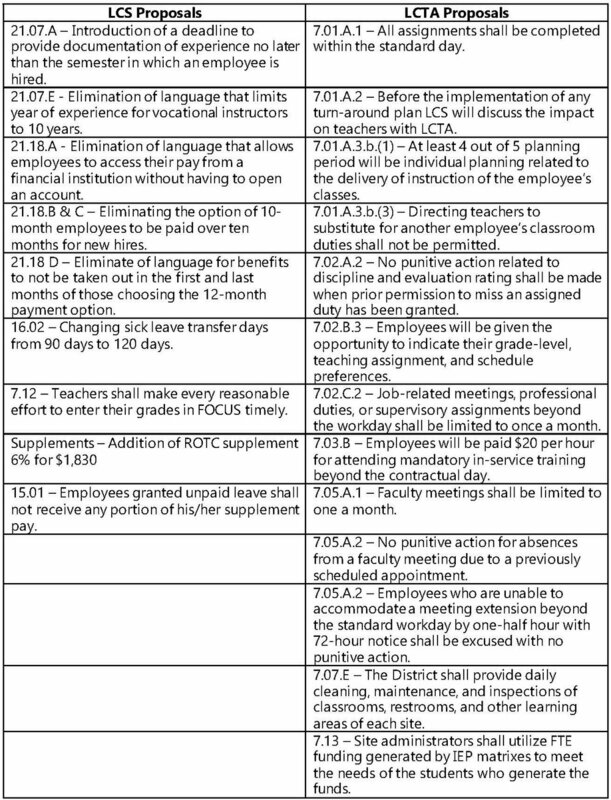 All language with a strike-through indicates proposed deletions of existing contract language. In addition to the above language proposals, the following compensation package was shared as well. *Educators still can apply for the Best and Brightest that is tied to SAT/ ACT scores. LCTA/LCS 2018-19 Contract negotiations have begun! Welcome back dedicated educators of Leon County Schools! Both teams met on Thursday, August 9, 2018 for our first session of the 2018-2019 school year. We discussed, in general terms, what issues may be brought to the table for future contract negotiations. Future meetings will be planned for August and September and members of the bargaining unit will be notified via school email. Details will be shared soon. Thank you to the members and potential members who showed up and supported the LCTA Bargaining Team, being visible and engaging in the process makes a difference. Encourage others to voice their concerns with policymakers and show up to future meetings. If we do not increase our membership to the 50% threshold, next year’s contract negotiation could be without LCTA’s input and all or portions of the condition could be voided. Contact your LCTA Building Rep to learn more about future negotiations and how you can assist in advocating for the resources you need to be successful in the with students and at home. Not printed but placed on the handout to admin and posted on TNL, LCTA, and Labor Relations. House Bill 7069 has rendered Article 13.02 null and void. However, management will continue to agree that Annual Contract Teachers will be renewed in accordance with Florida Law and Leon County School’s best practices. FOR A PRINT OUT TO DEFINE BEST PRACTICES – We can bargain to put this in the contract. Following the evaluation process with fidelity. All parties have a shared responsibility to foster best practices to improve student achievement and school climate. The non-reappointment process will be conducted in a thoughtful and considerate manner. Click the following buttons to review the tentative language for the 2017-2018 LCTA/LCSB negotiations. Below you will find a bargaining summary. There will be no Performance Pay or salary increase. Although LCTA proposed increases in base pay of $1,500 for staff rated Highly Effective and $1,125 for staff rated Effective, LCS rejected the proposal. All Highly Effective instructional personnel in the LCTA bargaining unit (including media specialists, guidance counselors, program specialists, behavior program specialists, occupational therapists, physical therapists, social workers, and school psychologists to name a few) will receive a bonus of $1200 based on their 2016-2017 teacher evaluation. All Effective personnel in the LCTA bargaining unit (including media specialists, guidance counselors, program specialists, behavior program specialists, occupational therapists, physical therapists, social workers, and school psychologists to name a few) will receive a bonus of $800 based on their 2016-2017 evaluation. 10% increase in the Supplement Base. The base is currently at $27,700.00; the increase would take the base to $30,500.00. Up to 2 hours of release time granted for employees to attend ceremonies/performances/orientations/parent conferences for their own children and/or their legal dependents. Teachers who are assigned supervision during special area will now receive compensatory time. Additional rights for teachers who substitute for another employee’s classroom. Additional rights that protect teachers from classroom interruptions and visits from unauthorized personnel without 48-hour notice. This is a 24-hour increase and limits the observation to 1-hour. Secured teacher authority to determine student’s final grades. The eliminated language which delayed 12-month payment employees from receiving their first retirement check. Employees can now receive, access, and download their final evaluation results electronically via the LEADS platform. Employees who agree to work a Leon County School Board shelter will be paid $25/hour. School sites that have been designated by the Florida legislature as one of the “Lowest 300” have language that allows for school-specific interventions, flexibility, and strategies to be employed to improve student performance. 2013-2014: The LCTA achieved a salary increase of $2182 for teachers with more than one year of experience. First-year teachers received a $1000 increase within their first month of teaching. 2014-2015: 4% increase to the total amount allocated for instructional staff salaries. The multi-year deal fixed the salary schedule which limited salary mobility of teachers in their first 20 years of service. 2015-2016: 4% increase to the total amount allocated for instructional staff salaries and 1 million dollars for Performance Pay based on 2014-2015 evaluations. 2016-2017: Even with only a 1% increase in funding by the state for public education, LCTA was able to bargain 2 million dollars in Performance Pay based on 2015-2016 evaluations. A copy of each site’s compensatory time plan will be submitted to their district supervisor and given to LCTA to ensure a plan is in place. The employee and site administrator shall meet about any concern regarding class size and/or class load. Add language ensures that the Board shall provide funding for approved instructional materials so that all students will have materials and all teachers, including ESE and enrichment, will have teacher’s editions. Progressive Discipline has been added which is to be used in place of iObservation Domain 4. All site administrators will be trained using the District’s adopted programs. This appendix included the removal of “Extend 45 (E45)” which paid a teacher a supplement rather than their hourly salary rate. What does LCTA have to offer? Annual Contract teacher protections beginning in the 2016-2017 school year. Instructional employees will no longer need to punch a time-clock or sign-in or sign-out unless it is part of an employee's improvement plan. Teacher transfer day will now be open to teachers with three years of service and having a rating of Effective or higher on the instructional practice portion of their current evaluation. Employees will only need a copy of their orders to report with a request for leave to obtain military leave. New hires will receive a notice of their salary within 30 days of being hired. An appeals process will now allow instructional staff the opportunity to be observed by a third party observer if a resolution cannot be met with their administrator and a panel sustains their concern. Teacher Observation Appeals Process: If a teacher is concerned that his or her instructional practice score was inaccurate, the teacher will present their concern to the site administrator. If a resolution cannot be found, the parties agree that a five-member evaluation review panel will review the teacher’s concern. Should the panel sustain the teacher’s concern; a third-party observer will be assigned by the District. Annual Teacher Observation Deadlines: All annual teacher observations must be completed more than a week before the reappointment process begins. This year, all observation (formal, informal, and walk-throughs) must be completed by 4/19/17. Required Feedback: For any observation less than Effective, teachers are required to receive specific feedback for the purpose of developing instructional practices. Self-Assessment: Instructional staff must complete the self-assessment, but they are not required to assess every section. Hold Harmless Language: Because of state changes from the NGSSS to FSA, LCTA led the way by requesting hold harmless language for teachers with VAM. No teacher was evaluated less than Effective. Student Learning Objective: Instructional staff must account for all students on their role. However, LCTA advocated for having students matched and qualified. You shouldn’t be held accountable for students who are not present in your class. In 2014, LCTA supported a teacher and member of LCTA who was elected to the Leon County School Board. This year LCTA continues its efforts to support LCSB candidates who support teachers and public education. Leon Classroom Teachers Association (LCTA) has worked with LCS to have all Student Learning Objectives (SLOs) tied to "matched" and "qualified" students. The language applies to all Student Learning Objectives even if the language isn’t written into a teacher’s SLO’s. Teachers have always had this component of the evaluation tied to "matched" students. Now, teachers have "qualified" language too! In addition, a modification to last year’s state teacher evaluation system proposal was made and accepted by DOE. The modification will hold all VAM teachers harmless for the 2014-2015 school year.